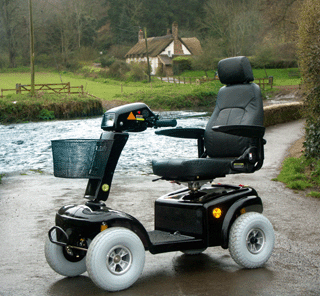 A mobility scooter is a mobility aid like a wheelchair but configured like a motorscooter. It is often referred to as a power-operated scooter or electric scooter. Electric mobility scooters have three or four wheels, and are steered using handlebars – very much like a bicycle. The seat is positioned over the two rear wheels, there is a flat area for the feet, and handlebars in front to turn the one or two steerable wheels. The seat may swivel to allow access when the front is blocked by the handlebars. them ideal for outside activities. Electric mobility scooters are available in a range of sizes and models, and come in lightweight, foldable styles and even those of a more sturdy construction will often disassemble for transportation. Which is the right model for you will be dependent upon your personal requirements. Are you mobile enough to manage a foldable electric scooter? Do you have a vehicle to be able to transport your mobility scooter? An electric mobility scooter has rechargeable batteries, and dependent on the model of scooter, can travel approximately 30 miles on a charged battery. The speed of the mobility scooter is determined by pressure on the forward/reverse lever. The legal speed for a mobility scooter outdoors on the sidewalk is 4mph. A Class 3, 8mph mobility scooter is road legal, and so can travel on the highway. By law, these have to be fitted with full lights and indicators. This type of electric scooter is larger and more luxurious than those designed to be dismantled and transported in a car boot. Electric foldable mobility scooters are lightweight are usually weigh around 250 lbs. The prices of scooters do vary, dependent upon make and model, and whether new or used. Used prices can start at around $400, and new prices can start at around $750.